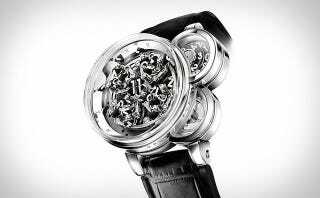 The Harry Winston Opus Eleven doesn't need watch hands. It's got main cylinders which disintegrate and re-assemble every hour to tell you the time. The three cylinders are meant to "deconstruct" time—with the biggest circle housing 24 placards that rotate and move every hour on a complex series of gears. The small top circle displays the minutes while the small bottom circle displays the beat of a titanium balance-wheel.